The winter months are rolling in, and with summer well and truly over it’s about time we start planning our winter diets! ‘Diet’ doesn’t have mean cutting down on foods or bulking up to get your ‘winter body’, but in fact focusing on the types of foods that will fuel our bodies for the right climate. It’s a known fact that student houses are cold, so if, like me, you’ll be spending your winter in 5 jumpers, 3 pairs of fluffy socks and an 18 tog duvet, you’re going to want to fill your cupboards with foods that will mean you can start to lose some of the layers! Healthy, gluten free foods can be warming too, it’s just knowing what to do with them and learning how to make them that little bit more exciting. 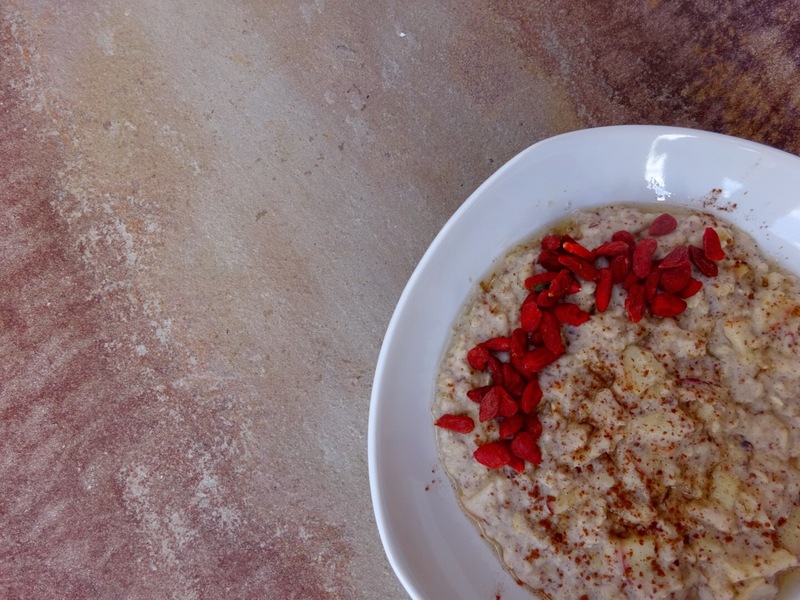 My apple and flaxseed porridge bowl is a steaming hot recipe that makes the perfect winter breakfast to fuel you up for the day ahead. If you’re one of those people who likes to mix your meals up, perhaps going for a breakfast dish for dinner (guilty), put your hands in the air, because no one is going to judge you for this, instead they’ll be pestering you for the recipe! That dull porridge bowl will never be the same again. Core the apple and finely chop or grate into a saucepan. Add the gluten free porridge oats, almond milk and cinnamon and turn on the heat until the mixture starts to boil. Turn down the heat and constantly stir the mixture, making sure it doesn’t curdle or turn to a scrambled mush! Once the oats have absorbed the majority of the milk, add in the flaxseed and stir. Once the liquid has been absorbed, pour into a bowl and sprinkle some additional cinnamon on top. Add the goji berries, or any other fruit that you like (blueberries also work really well) and squeeze some agave nectar over the top to sweeten. Enjoy on a cold winters morning with a cup of green tea on the side. Mmm looks great! Do one for tea/ different types of coffee! Thanks! Okay I’ll have a look into it 🙂 keep your eyes peeled!